Craig Carney went close for Lancaster City in the early stages. Two goals from former Morecambe striker Richard Brodie saw Lancaster City’s slump continue at Rushall Olympic on Tuesday night. Phil Brown’s side lost for the fourth time in five Evo-Stik Premier Division games with Brodie putting the hosts in command in the first half before Lewis Archer made sure of the points late on. Craig Carney did go close for the visitors as they made a solid enough start but after seeing a header saved by Josh Powell in the City goal, Brodie opened the scoring on the quarter hour. Danny Waldron was the architect down the left and he broke into the area before feeding the ball to Brodie who made no mistake to put the Pics in front. The well-travelled former front man has his and his side’s second just after the half hour mark, converting from close range after Andre Landell’s cross was only half-cleared. Brown lost defenders Ben Hudson and Steve Williams to injury at the break but saw his side have their best spell of the match after the interval. Joe Slinn’s double save midway through the half kept out first Ryan Winder and then Mamadou Djabi and frustrated City as they couldn’t find a way back into the game. Any doubt about the final result was ended 10 minutes from time when Archer broke clear and finished beyond Powell. 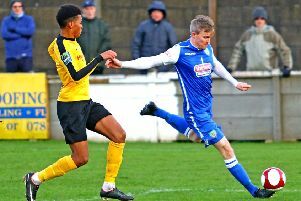 “We did okay for the first five or 10 minutes and had a couple of half chances,” said Brown, who saw parallels with the 4-3 defeat at Matlock on Saturday. “They’ve broken away though and scored after some more poor defending. “It was exactly the same as Saturday, a lack of resilience and character and quickly we’re two goals down. “I lost two centre halves at half-time and ended up with Paul Jarvis at left back at Craig Carney at right back. “We came out fighting though and dominated for 30 minutes and could have had two or three goals but after another breakaway and some poor defending, admittedly from a depleted defence, the game’s done.